Wander: The Collaborative, Non-Combat, Non-Competitive Exploration MMO Game: F.A.Q. What is the aim of Wander? Wander starts with you being an Oren surrounded by a beautiful, detailed rainforest. The introduction tells you that you are confused but curious as to what is going on. Players literally wander and explore within the rainforest, led on by their curiosity and sense of adventure. Aiding you in your journey are the exquisite voices of opera singers, who gently beckon you to discover where they are coming from! You will encounter various objects, such as Lore stones, Rozhda stones and Transform stones, as well as various structures such as caves, waterfalls, lagoons, buildings, even a city! The best way to explore Wander is to transform into forms – Oren, Hira, Griffin and Azertash – each form has unique characteristics such as fast swimming, flying or summoning fireflies to light the way. As Wander is an MMO, we encourage players to try to communicate with other players using Rozhda (language of Wander) and show others discoveries they may have made. To help others with things such as achievements or even how to transform into other forms. For example, if you are a Griffin, you can offer to give a Hira a lift on your back and explore the world together! Is there a tutorial on what the controls are? We’ve had a lot of feedback and we will be introducing the following in-game visual to better explain the controls for Wander. Rozdha is the unique language created just for Wander. It’s the language that users communicate in-game with by drawing glyphs. How do I use Rozhda? Rozhda is the language used to communicate with other players in Wander. Words and phrases are learned by interacting with different Rozhda stones encountered throughout the world, which will show you a short tutorial on how to draw the glyph. The order of what strokes are drawn to create the glyph is very important. To speak Rozhda you need to draw the glyph and this is done in different ways. Right click using your mouse to access Rozhda mode. You should see a list of Rozhda glyphs you have learned from encountering Rozhda stones. You can scroll through this list using the scroll wheel of your mouse. Scroll to the Rozhda glyph you wish to use and you can either trace the stokes of the glyph along with the tutorial and right click to speak, or you can right click on the glyph tutorial and your form should speak the Rozhda. To exit the Rozhda menu, scroll until you see 'Exit' and click the right mouse button. 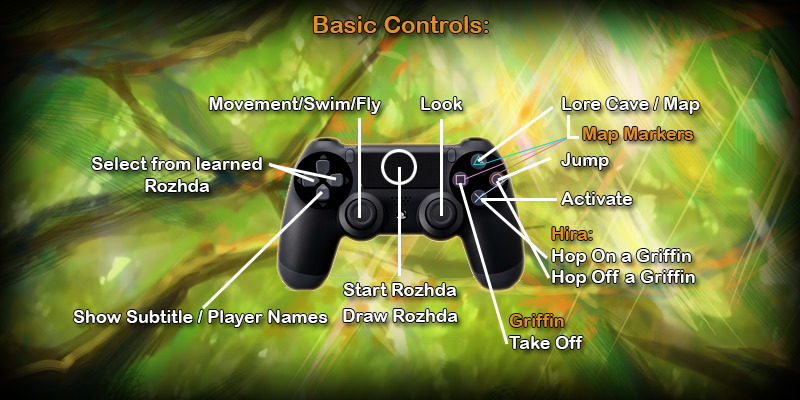 Using the touchpad on your DualShock controller, without pressing down into the pad, trace the lines in the order according to the tutorial for the Rozhda you wish to speak. Yellow lines should appear on screen as you do this so you can see what you are drawing. To ‘speak’, use two fingers to tap the surface of the touchpad at the same time. If you have drawn the glyph correctly you should hear a voice say the Rozhda word. If you hear a cough or a sharp intake of breath that means that your glyph was not correctly drawn and this sound is feedback letting you know.Using the left and right on your D-pad to access Rozhda mode. You should see a list of Rozhda glyphs you have learned from encountering Rozhda stones. You can scroll through this list using the D-pad. Scroll to the Rozhda glyph you wish to, press down on the D-pad and you will be able the Rozhda automatically without drawing the glyph. To exit the Rozhda menu, scroll until you see 'Exit' and press down on the D-pad. How do I get to the Griffin/Hira/Azertash transform stone? We strongly encourage players to explore and follow different paths as well as listen out for the voices of opera singers which will get louder as you get closer to something really interesting like a transform stone. If you do get completely lost, don’t worry! Try backtracking a little, you might have missed a path off to the side you didn’t notice before, or you could give bush wacking a go and see where that takes you! How do I fly as a Griffin? As the flight mechanics of the Griffin are based upon real-life principles used by professional paragliders, it’s important to be aware of thermals. 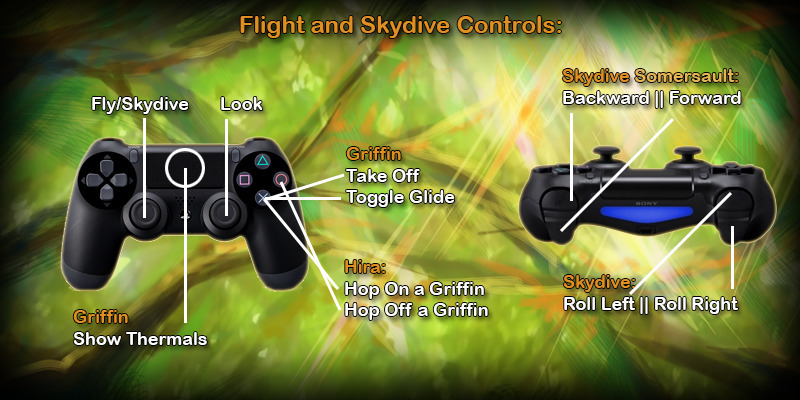 As a Griffin you can see thermals by holding down the left mouse button (Steam) or by pressing down on the touchpad on the DualShock controller (PS4). Thermals appear as patches of red or white wavy lines above certain areas. White – Lift/Up draft. These will help lift your Griffin up and stay in the air. Red – Sink/Down draft. These will force your Griffin down towards the ground and make it very hard to take off. Ensure you are in Griffin form. It’s always good to check if there are any down drafts in your immediate area by holding down the left mouse button. Down drafts will make it very difficult to take off, so best to move away from those areas. Press “G” to flap your wings to take off. You can also use “G” in mid-flight for small speed or altitude boost if you have enough stamina. 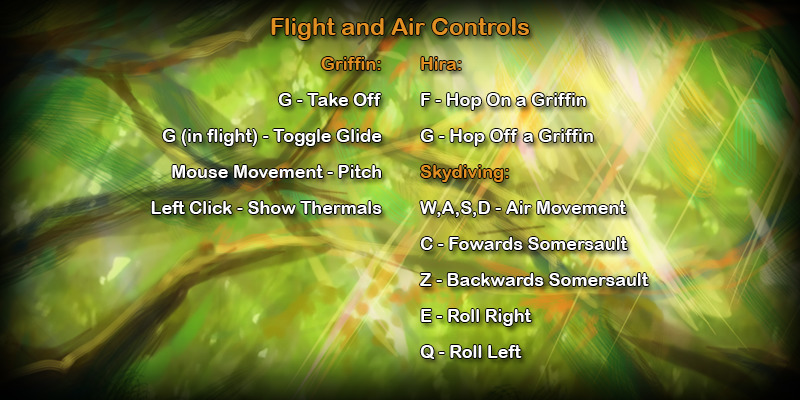 You can control the Griffin’s direction by using the WASD keys. Ensure you are in Griffin form. It’s always good to check if there are any down drafts in your immediate area by holding down the left mouse button. Down drafts will make it very difficult to take off, so best to move away from those areas. Press SQUARE to flap your wings to take off. You can also use SQUARE in mid-flight for small speed or altitude boost if you have enough stamina. You can control the Griffin’s direction by using the left stick on the controller. How do I do skydiving tricks as a Hira? As a Hira you can do execute tricks whilst in freefall. On keyboard use Q, E, Z and C.
On DualShock use, L1, L2, R1 and R2. What is the Lore Cave and how do I get into it? The Lore Cave is a special area where there is a map of the world so far and contains stones which allow you to change into forms you have previous unlocked. At this point in time, the map and it’s features are disabled and are being worked on. To gain access into the Lore Cave you must have discovered and unlocked one of the forms besides the Oren (Hira/Griffin/Azertash), and have interacted with a Lore Stone afterwards. For Steam: Press the ‘M’ key to enter and exit. For PS4: Press the TRIANGLE button to enter and exit. The camera is clipping through objects like rocks and walls. This is an issue that we are aware of and this will be addressed in the next patch. Plants/rocks/trees/objects are suddenly 'popping' into view. Is this normal? The reason you're seeing objects "pop" into view is due to textures being slow to load. We're currently looking into this as to how we can have textures load into view faster. I think I just fell through a rock! Falling through rocks is definitely not a feature we intended. This is a collider issue and we are fixing it! My form is too slow. I want to walk faster! Different forms have different speeds but we will tweak in time based on what feedback we get. Oren – As a large tree-like being, it’s fairly slow but it’s enormous legs cover fair distance and is great on land. Griffin – A form that can fly. A tutorial will show you how to once you unlock this form. Hira – A humanoid form which has fin like attachments to the back of the legs and arms. Doubles as a wing suit enabling the hira to perform skydiving tricks and increasing the hira’s swimming speed. Azertash – A small sea-loving form that resembles a lizard-dragon hybrid. Not particularly fast on land but is cable of swimming incredibly fast in water. In all forms except the Oren you can toggle sprinting by pressing SHIFT once while moving forward in the Steam version and press down once on the left stick to activate L3 on the DualShock controller. As of the next patch, the default movement speed of the Hira will be her sprinting speed, and that the hidden stamina gauge mechanic will be irrelevant. Is there going to be day/night cycles? Yes! This is already enabled in Wander currently. Are there going to be environmental events like weather? Yes! That will be coming in additional patches as we add more features. Will you be adding NPCs, like wildlife to Wander? We don’t currently plan to add any NPCs or additional non-player life forms to Wander, due to the reason we want the emphasis to remain on the players interacting with other players within the game. That sense of surprise when they spot a sudden movement on screen - like a slight movement around the treeline - and know it’s another player, rather than a lizard scurrying past (for example). Will you be adding quests, puzzles or minigames? Our aim for Wander to be a game that players can relax, and not have to work at, such as completing a task or downing a boss. As a lot of games follow a more traditional system of questing and minigames, Wander aims to move away from that and offer a different sort of freedom for players, rather than being told what to do and where to go. We may implement similar features later down the track but we don’t have it in mind to currently. When is ‘x’ going to be fixed?! We understand your frustration and are sorry as we really want have everything working well so we can give you best experience, but unfortunately bugs do happen. We’re working really hard on coding fixes and aim to get them out as soon as possible. We do have to prioritize what issues we deal with first. It should be noted that releasing patches and updates for the Steam version is more straightforward than for PS4. We are able to upload and push updates through the Steam client faster, but with updates for PS4, we need to submit them to Playstation for it to go through their processes before it is pushed through the network and is available for players. Due to that there may be a delay for updates to appear for PS4 players. Do you plan on adding additional content to Wander? We most certainly do! We have a lot of ideas in mind and have received a lot of suggestions too so we have plenty we want to show everyone! Are there going to be more forms in Wander? Definitely! We have lot of ideas we'd love to bring to life! For PS4 we have localization for English, French, Japanese and Russian. For Steam users, we have localization for English, French, Japanese and Russian. Partial localization (interfaces and trophies) for Italian, German, Spanish, Portuguese, Swedish and Turkish. We plan on adding more localizations! Oh no! Fear not because we have a feature that could help you out… Our unstuck option! Hit ESC (Steam) or OPTIONS (PS4) to access the main menu. Select ‘Can’t move?’, confirm ‘Yes’ and it will teleport you to the last stone you interacted with. This includes Lore Stones, Rozhda Stones and Transform Stones. I don't know how to use/do something, can you help? We've had a lot of feedback from our players regarding clarifying how to use certain features. We will be tweaking in-game tutorials over time to make it clearer and easier to understand to understand how to use features within Wander. Also, please keep an eye on Twitter/Facebook as we sometimes do video tutorials on features, current and upcoming. Live stream Q&A sessions are also a good way to request to see how something is done and to ask questions! (Times will be announced on social media). I’m crashing a lot and/or losing progress! Launching any multiplayer game can be challenging and as a small studio we only have 4 PS4 kits to test with, and thus failed to sufficiently test how the game would behave with 1000s of players. This has led to numerous crashes and a very poor experience for our early players which is very disappointing for them and us. There is a patch to be released that will address these issues. At this point it is unclear but we hope so. But in the case where your progress has been completely reset, we’re extremely sorry about this! Can I play with my friend in another region? At this point in time players who have purchased Wander from the NA (North America) PS4 store can only see and interact with other NA PS4 players. The same applies for EU (European) PS4 players. We would definitely like to see there be cross-realm play and we will be working closely with Playstation to enable that to happen. My trophies aren't syncing up with PSN! I'm being awarded random trophies for things I haven't done! Unfortunately that isn't supposed to be happening. We're looking into why this is happening. We are very small studio made up of a core team of less than 10 people currently. 3 of whom are full time. The Wander team is based in Melbourne, Australia. How long has Wander been in development? Wander has been in development since 2012, and is the brainchild of Loki Davison who was inspired by his travels around the world and here in Australia.